The first words of today's gospel for this feast of the Holy Family set the tone: Mary and Joseph are on their own. The wise men have saddled up their camels and left town, leaving behind them lingering scents of frankincense and myrrh and some gold as well. The little family departs soon after as well, slipping away at the behest of the angel of the Lord, who tells Joseph to head south toward Egypt and safety, away from King Herod's frantic, lethal fear. Perhaps the gold will come in handy on the road. So Mary and Joseph set out on yet another journey, this time with the newborn. Before his birth, they had been a couple; now they are a family. How mysterious that the first act of this new family must be to run away, to seek shelter in a strange country where they know nobody, where they dont speak the language, and where they dont know when they might be able to go back home. How mysterious that Jesus first experience of life will be as a refugee, an asylum seeker, an illegal immigrant. How mysterious, and yet, how just. Jesus has come to be one of us in every way, to share our experiences in the deepest way possible, to share our life with all its joys, but also all it's poverty and pain. At the end of this Year of Our Lord 2016, when we've seen so many hundreds of thousands, if not millions, of people running away from devastation caused by natural and man-made disasters, we also see that Jesus, with his mother and foster father, shared in that experience. And our faith tells us that he continues to share in that suffering and pain right now: hiding from the militia in the bush of Congo or Central African Republic, trying to cross the no-man's land between Syria and Jordan while under shellfire, huddling under a plastic tarp in the Philippines as Typhoon Nina passes by. Yes, he's been there and he's still there, washed up half dead on the shores of Lampedusa after the hellish voyage from north Africa or locked up in a New Mexico detention center for illegals who've made the terrible trek through the desert from Mexico to the U.S. How mysterious, yet how right it is that Jesus, our Lord and our God, begins his training for our life when he is completely helpless, completely dependent, and that this training consists of such an experience. All of this brings us back to the notion of family. Jesus needed mother and father to carry him through this first harrowing experience of life as a member of the human family. 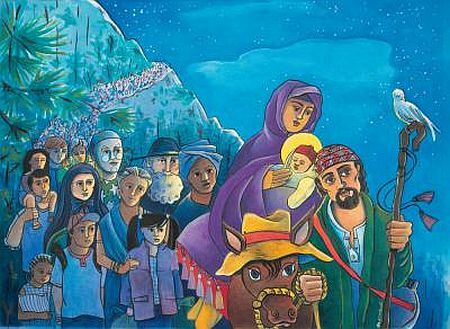 But he also needed them for other experiences of that same life: experiences of joy and tenderness, of work and play, experiences of himself as son, in relation with them and then with others other members of the families of Joseph and Mary, their friends and neighbors. The Holy Family gave Jesus his first understanding of who he was in the world. How about your family? It's probably a mix of good and bad, sometimes more one than the other. You've surely got some scars as well as some good memories; most likely youd say, "Well, were not exactly the Holy Family, you know!" And yet -- you know -- every family is or can be a holy family, even if only for a heartbeat. And the family that you're with right now whether you're a mother, a father, a son, a daughter, a sister or brother, a grandma, uncle, auntie, or cousin three times removed or even just a friend: that's for real. That's where you're living your life. Why not turn to that life and those people today in love and gratitude? And while you're turning, be prepared to see Jesus in the midst of them all, right there in the laughter and the tears, the chaos and the anger, the long-suffering and the creativity, the wonder and the love. Why? Because that is his name: Emmanuel, God with us.